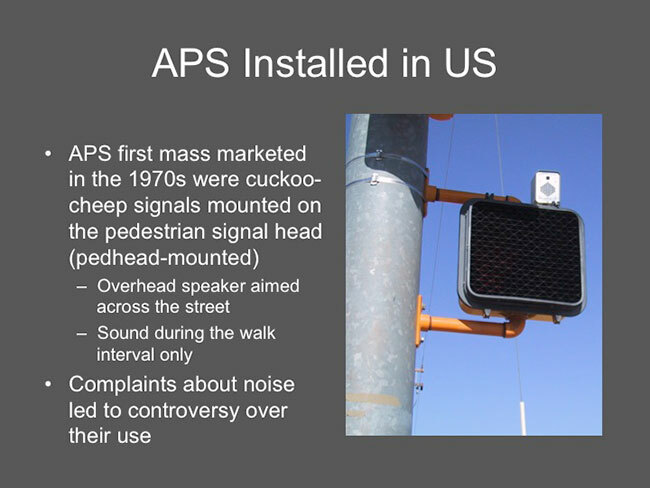 The APS first mass marketed in the 1970s were cuckoo-cheep signals that were mounted on the pedestrian signal head, usually called pedhead-mounted audible signals. The overhead speaker was aimed across the street and sounded during the walk interval only. These signals were typically adjusted to be quite loud and complaints about noise led to controversy over their use. Many blind people felt they interfered with their ability to hear traffic. Also there were philosophical concerns that irritation with the sounds resulted in negative attitudes about people who are blind. The photo on the screen shows a speaker mounted on top of the visual pedestrian signal head.